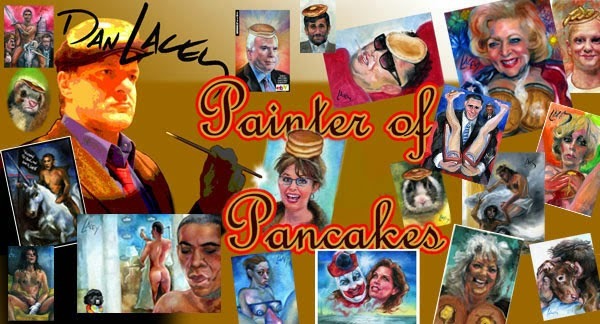 A portrait of US television actress Roseanne Barr enjoying pancakes in a scenic Bob Ross style landscape with a Trump style MAGA Make America Great Again red hat upon her head. A challenge to paint upon canvas board; perhaps it is the natural buoyancy of a stretched canvas which encourages a variety of brush stylings-this image lent itself more towards illustration than spontaneous and intuitive painting. An ominous meteor colored like a matchstick heralds a coming scene; the pancakes to the bottom of the image are unfinished and evocative of post middle age mammaries. This was a commissioned image; prints of the same are available on my etsy.